Richard of St Victor, a native of Scotland, had a successful career as a monk at the monastery of St Victor in Paris until he died in 1173. Following the teachings of Hugo of St Victor, his master, he wrote about the Bible to help monks contemplate its mysteries. In this book, although writing about an Old Testament vision of a temple on a mountain (Ezekiel 40-48), he tried to understand it in a way that broke with earlier traditions, which understood the vision symbolically. Richard saw the complex biblical passage as a literal description of the physical Temple in Jerusalem. Illustrations were a part of his book, meant as aids for the difficult bits on measurements and design of the building. 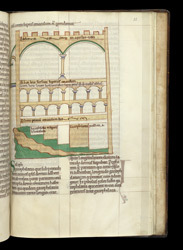 Either Richard himself or a draughtsman created the illustrations, making use of their knowledge of all types of grand buildings--civic and military--that they saw in 12th-century Paris. Demand for the book quickly grew. This copy was made in Gloucestershire for the monastery at Lanthony (or Llanthony) not long after Richard's death. It was originally part of a larger volume containing sermons and material on church services. The illustrations show the Temple and its surrounding structures in elevation (design of walls) as well as in plan (the floorplan). This drawing shows the elevation of the Temple with its three levels and understructures. It is built according to contemporary building techniques: the arch, repeated to form a sturdy arcade capable of supporting levels built on top of it.